The story of this beer is that there is no real story - it’s just M.O.na Pale for Mona Vale. But unfortunately that’s selling the beer a bit short. This US-inspired pale ale started out in the brewery's permanent range before being bumped to a seasonal when they rebranded at the end of 2015. 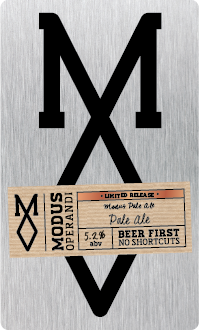 When they first opened it was Modus Operandi’s least-hoppy hoppy beer, but in saying that it sure ain’t short of hops. That’s thanks to six different additions of US Centennial which helps produce a beer bursting with aromas of lemon and pine and a fairly aggressive bitterness. The real magic though is that it’s bold while managing to keep everything in harmony: fragrant at first, dry and bitter to the last and a pleasure the whole way through.